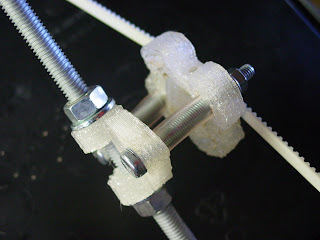 One RepRap part not covered much elsewhere is the belt tensioner. Here's the one fitted to my Darwin - it was printed out on aforementioned Darwin using a screwdriver in a clamp-down vice as an impromptu tensioner. There is another version for ball-chain with a groove in the idler. These allow you to tension up the belt without moving the position of the Z posts. The design is a little unusual in that I have used a piece of 3mm PLA filament as the axle for the idler wheel instead of the usual M3 bolt. To fix it in place I simply heated one end and pulled it into the body of the idler holder - instant welded axle. I've just designed one for the lasercut RepRap kit. Hopefully I'll get that run off next week and we'll see how well it works in practice. next up: some thrust bearings plz. the "nut on washer w/ grease" trick just doesnt cut the mustard.